Follow basic block ghost edges. 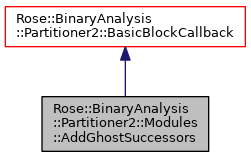 If this callback is registered as a partitioner basic block callback then the partitioner will follow ghost edges when discovering instructions for basic blocks. A ghost edge is a control flow edge whose target address is mentioned in the machine instruction but which is never followed. Examples are branch instructions with opaque predicates due to the compiler not optimizing away the branch. An alternative to following ghost edges as basic block instructions are discovered is to look for dead code after the function is discovered. That way the CFG does not contain edges into the dead code, which can make things like data flow analysis faster. Definition at line 181 of file Modules.h.